The REI Trail 40 is a 3-day pack designed for backcountry adventures and performs amazingly well for hiking, travel, and everything in between. The perfectly sized travel backpack carryon has a durable build, well thought out pockets, and simple, lightweight design. The Trail 40 is one the best carry on backpack options for adventurous souls that want to travel with only a carry on through urban destinations and continue into the wild. 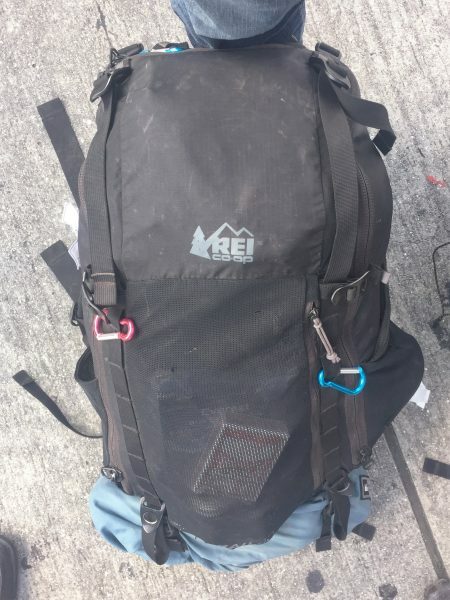 My experience with the REI Trail 40: This backpack was only travel bag, with a small, compressible daypack, for 6 months of travel from sea to summit (literally) through Southeast Asia and South America. 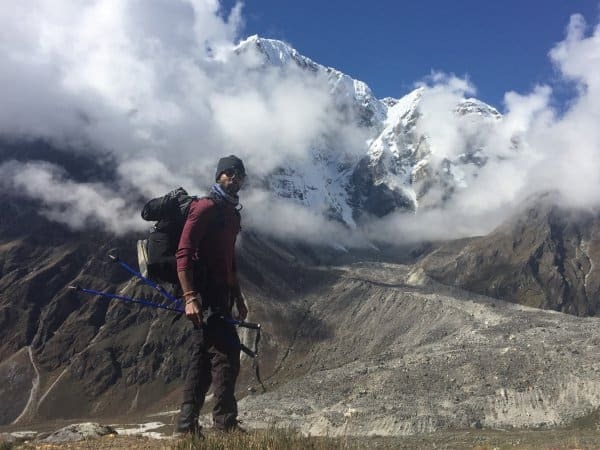 The highlights were a motorcycle trip through rural Vietnam and Laos, and the trek from Lukla Airport to Everest Base Camp hiking 74 kilometers up to 17,600 feet in elevation. The Trail 40 handled every adventure well and stayed comfortable every step of the way. For the price (~$120), you’ll be hard pressed to find a better performing, more durable, and more well-rounded hiking and adventure backpack that still fits airline carryon size restrictions. 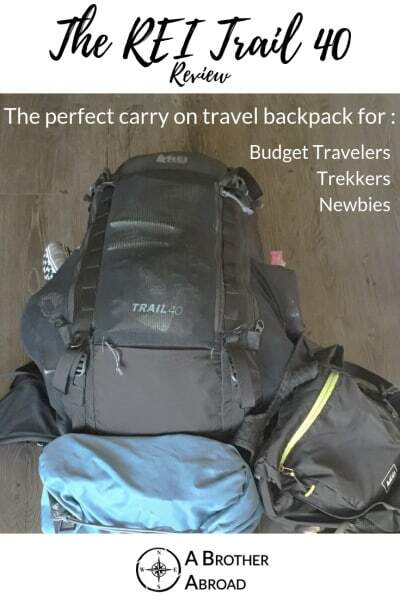 Based on my experience with the Trail 40 over those 6 months, this is the best carry on backpack in the “cheaper” category for newbie travelers and anyone who plans to hike or trek. Highly recommended. 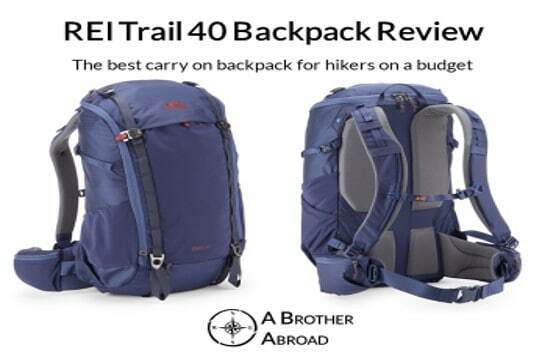 In my opinion, the REI Trail 40 is the best carry on backpack at the price for adventurous travelers, performing amazingly on the trail and making airline travel easy along the way. Estimated lifespan of 2 years with hard use — constant traveling and 45lb+ loads — at which point the straps will probably break first. 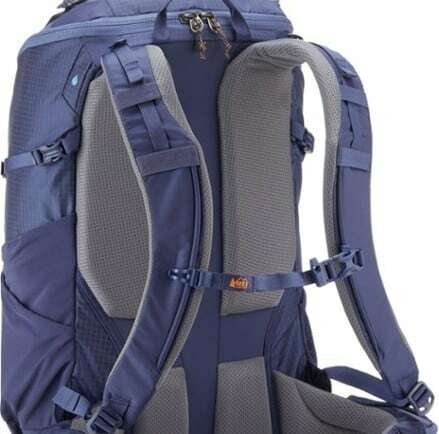 A very capable and well thought out “3-day” hiking backpack that performs extremely well on the trail through miles of walking and heavier loads than intended. For travelers, the backpack’s carry on size makes avoiding baggage fees possible on even the strictest of airlines while staying ready for outdoor adventures. 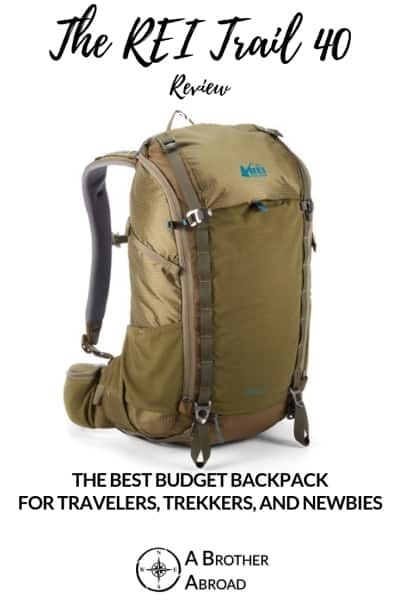 For the price (~$120) you’ll be hard pressed to find a better trekking and travel backpack. …I loved it the entire time. For 6 months, I traveled through Southeast Asia and South America with the REI Trail 40 as my only bag using it as my sole travel backpack carry on (with the REI Flash 22 as my daypack) and it performed amazingly. 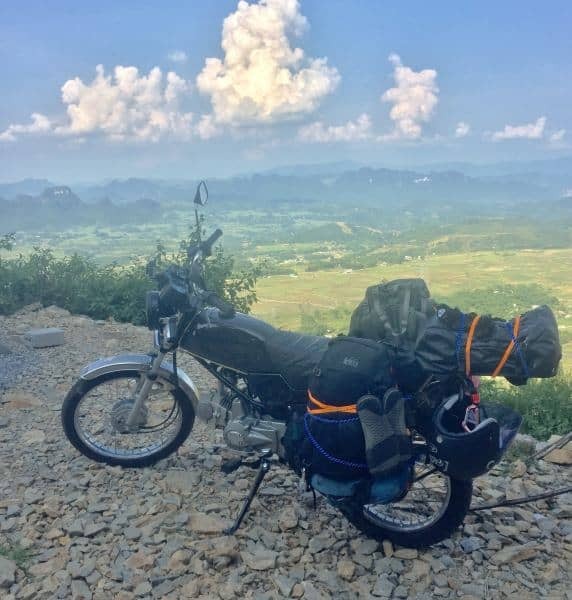 The trip included a motorcycle trip through rural Vietnam and Laos where it performed well strapped to the back of my bike. Though I learned it definitely wasn’t monsoon proof and the included rain cover doesn’t do much, the bag’s materials (210 denier nylon) and stitching handled being overstuffed, strapped tightly, and being thrown around very well. The bag did pick up some noticeable abrasion, but no holes. An old trick of rainproofing by lining the backpack with a large trash bag fixed its water weaknesses and waterproofed all of my gear inside, keeping everything dry through 8 hours of riding through Laotian rainstorms during the wet season. Back at sea level, I used the Trail 40 on several multi-day treks with 15-20kg and the bag performed just as well. Useful external storage: the mesh zipper panel pockets are great for storing wet or dirty stuff, the water bottle pockets are useful and easy (enough) to access with the pack on, straps on the bottom of the pack are useful for increasing storage using a sac like the GORUCK Tough Bag or simply strapping shoes or a sleeping pad and sleeping bag (like I did in the blue REI stuff sack containing my boots and strapped to the bottom of the bag). Airline size restriction compliant travel backpack carry on make it convenient for airline travel: Unlike the REI Ruckpack 40 the REI Trail fits perfectly as a travel backpack carry on for most budget airlines. 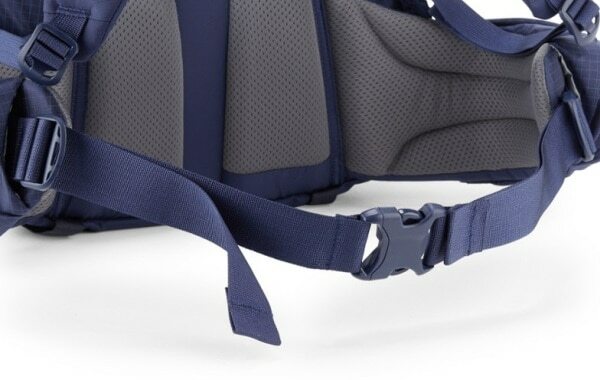 The mesh pockets on the front and sides are well streamlined, topped with compression straps (on the sides) making the bag easy to move through crowds with and less likely to be damaged on the rare occasion that it is checked. Loose shoulder straps and buckles may not travel on planes well just like with any summit style bag. Frequent flyers may consider the Ruckpack 40 (or read the REI Ruckpack 40 Review) as a budget option instead or checkout the Tortuga Outbreak or GORUCK GR3 as high dollar (and durability) items. Though I love the Trail 40, the elastin mesh water bottle pockets picked up a couple holes when India Airlines decided to drag my bag behind a truck while being chased by a pack of wild rhinoceroses…or something like that. You can’t expect this bag to last forever. Though this bag is well constructed and the materials are good, you can feel that the bag has a few years of life if used hard. You could easily extended this by patching as necessary and reinforcing the straps when the time comes (I will), but know that this bag is great but not bombproof. A mouse chewed its way through a mesh pocket trying to steal the last of my Reese’s Peanut Butter cups, and it appeared Air India scratched it up quite a bit by dragging it on the payment. So know that the Trail 40 will stand up to the rigors of hiking and camping, but the little things in life will eventually do it in. The YKK zippers offer great durability and through the wet, dirt, and grime never gave me trouble. Water bottle side pockets are oddly easy to take water bottles from, even with the pack on. Top zippered pocket (small) is a great place for securely storing valuable, quick access items like a passport and money (mine always stayed here). I do question reliability beyond 3 years if carrying more than 35-40 pounds often (multiple times weekly), but if reinforced with tubular nylon webbing, this pack could be used indefinitely. Like a true hiking pack, the REI Trail 40 backpack takes into consideration that different people have different bodies and this affects how the pack fits quite a bit, and ultimately how comfortable the pack is during a hike. The width of the shoulders, the width of the hips and circumference of the waist, and the distance between them severely affect how well this pack performs for you. Luckily, REI produces Small, Medium, and Large versions of this pack in both men’s and women’s. The differences between the small, medium, and large packs are simply 1 inch in height. The difference between the men’s and women’s packs are the width of the shoulder straps and the length of the waist straps to accommodate varying hip shape and narrower shoulders. The pocket setup (exterior and interior) give plenty of options for storing items for quick access without having to worry about pickpockets in the city and on trains in transit to your hotel or hostel. As carryon baggage, the Trail 40 is nearly perfect. It fits the carryon sizes for most airlines, is lightweight, and storage design allows you to easily access anything in the bag (like documents or your toiletries kit) without unpacking too much. The only time I had to check it was when I was last on the plane and there was no more overhead bin space. Bring a compressible sac to add external storage strapped to the bottom of the bag (via the sleeping bag straps on the bottom) and as a “leave behind bag” during long treks. I previously used the REI stuff sack which worked very well though it picked up holes over time. I recommend the GORUCK Tough Sack as a BIFL (Buy It For Life) item, which I use now. It has been extremely useful and insanely durable during my last 6 month trip. The REI Trail 40 is an excellent budget backpack for adventurous travelers, in a carry on sized package.